Some movies age well. Others don´t. The Guns of Navarone, a splendid UK/US co-production, is one of the first kind. Almost 50 years old but still fresh like on the day it came out. This is thanks to a lot of things. A gripping story, a great cast (Gregory Peck, David Niven, Anthony Quinn, Irene Papas, Stanley Baker, Anthony Quayle), wonderful cinematography, a nice score. What more do you want from a good war adventure yarn? I hadn’t seen it before (yes, yes, shame on me) and was really surprised how good it is. And very esthetic. It is one of the most esthetic movies I have ever seen. The year is 1943. Greece is occupied by Germany. The Germans who feel they are losing on the Eastern Front try to force Turkey to join them. 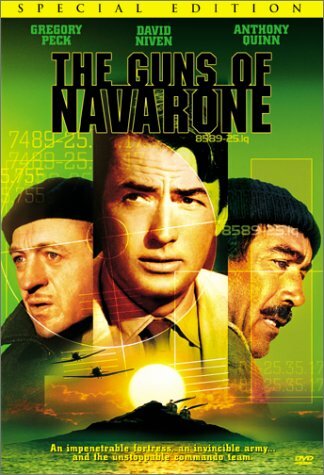 The Guns of Navarone tells us how a group of men tries to secretly enter a Greek island, meet with the Greek resistance and with their help sneak into a fortress to destroy two powerful German guns that threaten British soldiers who are marooned on another island. The mission is extremely dangerous and no one actually thinks they might accomplish it. The story, from the beginning to the end, is one gripping sequence after the other. Each one of them could almost stand alone like some sort of short story. First they fight the elements on a boat during a storm. Then they have to climb an impossibly steep rock. Every place they find themselves in is swarming with Germans so they have to hide often. In one episode one of them gets wounded and they need to decide if they take him along or shoot him. One of them betrays them and they need to decide whether or not to shoot the person. They get captured by the Germans but escape. Many things go wrong and not all of them make it. The best scenes for me are in the fortress. We hear a German song in the background and see this bunker with its typical Nazi esthetics. It is also a funny movie at times as the German´s really get their asses kicked. In one scene the group is hiding and a German guard hears them. To distract him they throw something and he runs off like a dog. There is also some humorous dialogue mostly coming from the stiff-upperlipped British major played by David Niven. The characters are well drawn, interesting and complex. Major Mallory (Peck) is a mountaineer whose expertise is needed for the mission. Miller (Niven) is an expert in explosives. Stanley Barker plays a trained killer who has problems with his conscience. I was quite surprised to see Irene Papas, the Greek singer, in one of the roles. I didn’t even know she acted. She plays a Greek resistance fighter. Quite a fierce character. Gia Scala´s role Anna is interesting and what happened to her illustrates once more the idea of the absurdity of war. This movie made me quite nostalgic. You don’t find many movies like this anymore. And no actors like these either.